The 88 Libertadores Cup final, which brings together Boca Juniors and Riverblit, both of Argentina, has been rejected in the final and most violent final in football history, as reported by Argentine newspapers in the first leg, scheduled for Wednesday but postponed for next Saturday (November 11th) for security reasons. The match is broadcast on Abu Dhabi Sports 2, which won the rights to transfer the game at midnight 12:00 pm, and the confrontation is unprecedented between the two rivals for the title of continental competition, and booked River Plate qualification card at the expense of Gremio Porto Brazilian, before catching him Boca Juniors after beating Brazilian club Palmeiras. Clasico Argentina is also known as the Super Clasico, and is locally called the Derby Buenos Aires, a derby match between Argentina's Boca Juniors and River Plate, one of the most important derbies in the world. The game is called the "rich and poor Classico", where the River Plate is located in one of the neighborhoods of the rich Argentine capital. The club's supporters accuse the River Plate club of "narcissism and class". And the clash between the fans of the two teams, and the incident is the most famous in 1968, when the stadium of the River Monemontal disaster, where the killing of 71 fans and injured 150 people after a stampede at the gate. The daily Clarin, an Argentinian daily, said the match between the two clubs would be "explosive", as would be seen by the fans of the two most popular clubs in Argentina, as well as those who watched the confrontation from the rest of the world. The newspaper added that it would be "unique" and "very unique," and added that the players of the two teams began to warn their opponents, ahead of the game expected, noting that the word will be the field. "The final of the century, the final bloody match of vengeance or shame match of life or death the greatest game in the history of South America, the fiercest and fiercest game in the history of black football on Argentina, which brings Boca Juniors to River Plate in the Libertadores final." "The refusal of a large number of referees reached 88 referees governing the match between the two teams for their constant association with attempts to threaten death, and the South American Union settled on the appointment of Chilean referee Roberto Topar after agreeing to run the meeting knowing that there is no preference to register outside the ground in both games. 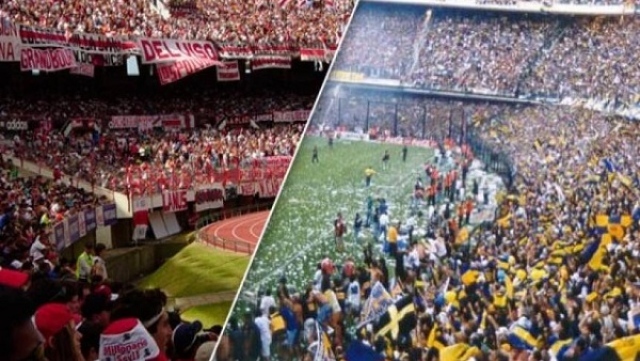 Due to the history of the two teams in the tournament before the final, the Alboca were in the final match 11 times and the last title of 2012, and won the tournament on 6 occasions, the River has attended the final in six occasions and the last title in 2016 and succeeded in winning the title on 3 occasions , And this final matches all the tournaments and final matches of the winning team, and cancels all the achievements of the losing team, whatever it is, which was covered by newspapers in South America. "The losing team will need a period of recovery from a loss of up to 20 years! "I do not wish to see this final as a security, it is better for a Brazilian team to win in the semi-finals because this final will result in 3 weeks of non-sleep. It will take 30 years for the loser to recover. Brazilians do not even happen this final. " In the last 6 matches between the two teams saw 57 cards (10 cards per game almost!) 51 yellow cards and 6 red cards. In a statement to the leaders of Boca Juniors and River Plate, Daniel Angelci and Rodolfo Donovrio said that the final leg of the Copa Libertadores' Copa Libertadores will probably be without an audience. "We want to analyze the idea well and on Monday we will see what its pros and cons are, and then we will make the decision together," he said in an interview with Fox News on Saturday night. "I will definitely agree with Donovrio."